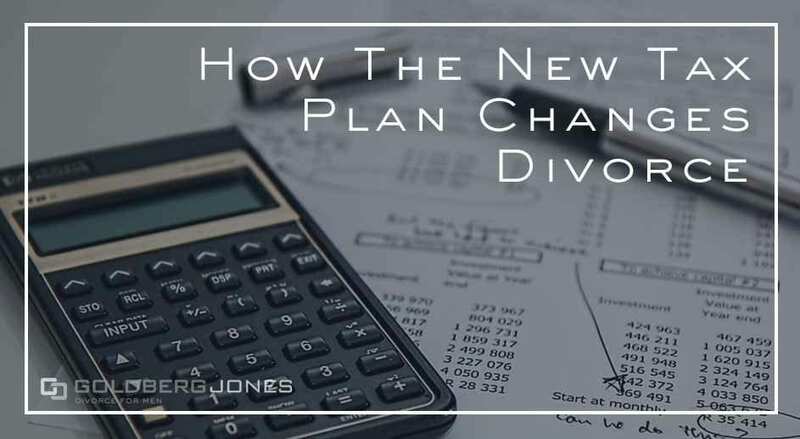 Now that it’s 2019, we want to remind you of the tax changes that arrived with the new year and their potential to impact divorce, specifically spousal support. Spousal support is court ordered payments designed to ease the financial hardship of dependent spouses following divorce. Many people refer to it as alimony colloquially. It usually factors into a divorce agreement when there’s a substantial gap between the earnings of spouses or in cases of financial need. A number of things go into determining spousal support. The court may consider the length of the marriage, age, health, earning potential, future job prospects, and other factors. In some cases, payments are temporary. These are usually intended to help one party get back on their feet. Under other circumstances, however, spousal support payments continue indefinitely. As far as spousal support is concerned, the new tax plan abolishes a deduction on alimony that’s been in place for more than 70 years. That means after December 31, 2018, the spouse who pays spousal support will no longer be able to deduct that amount. At the same time, the spouse who receives payments no longer has to pay taxes on that money. Right now the positions are switched. This is a huge deduction for the payer, since it’s an “above the line” deduction as opposed to an itemized deduction. It also means the recipient will not have to claim the payments as income and pay taxes on that amount. Many divorce lawyers expect this shift to change negotiation strategies, especially as 2019 approaches. The current deduction often saves the payer a significant amount and leaves more money to divide between spouses. The loss of the deduction may be washed away by the reduction in the gross amount. The new tax plan may also impact those looking to modify spousal support. After 2019, any changes will also fall under the same laws. It may have a dramatic chilling effect for those who have an argument for reduction. If you’ve thought about trying to modify spousal support payments, consider starting the process sooner rather than later. Others take the stance that the government should treat spousal support like child support. Those payments aren’t tax deductible for the paying spouse or taxable for the spouse on the receiving end. The new tax plan essentially aligns the two. The Joint Committee on Taxation, a congressional committee that investigates and reports on tax matters, sees another possible upside. Their findings estimate that abolishing this deduction will result in $6.9 billion in new tax revenue over the first ten years. There are, of course, people critical of the new tax plan. Those who oppose the measure claim that the higher-earner will wind up paying less while the recipient receives less. Essentially, the fear is that the person who needs it most will wind up getting less money and support. The present set up allows for larger payments with lower cost after taxes. One side gets a lighter tax obligation, while the other receives larger payments than they might otherwise. One estimate envisions payments could be as much as 10% to 15% smaller than under present regulations. This could make it more difficult to make ends meet and for recipients to support themselves. Some see that as defeating the purpose of spousal support in the first place. The new tax plan is going to have a substantial impact on spousal support, that’s clear. It may influence divorce, divorce settlements, and even divorce strategy and negotiations. That said, it’s probably not going to stop anyone from ending their marriage. No one divorces for the tax break; when your marriage is over, it’s over. Spousal support forms just one piece of the larger divorce puzzle, but it’s still an important one to consider. How it all shakes out in a particular case depends on the specific couples and their unique finances. But most couples who face spousal support will feel the impact. It’s also important to consider the timing and the implications for your situation. Especially if you want to modify your spousal support payments. Don’t put it off until the last minute and rush to get things in under the wire. There’s a potential traffic jam waiting in front of you.